Two highlights of the show demonstrate how it was sometimes a study in contrasts. 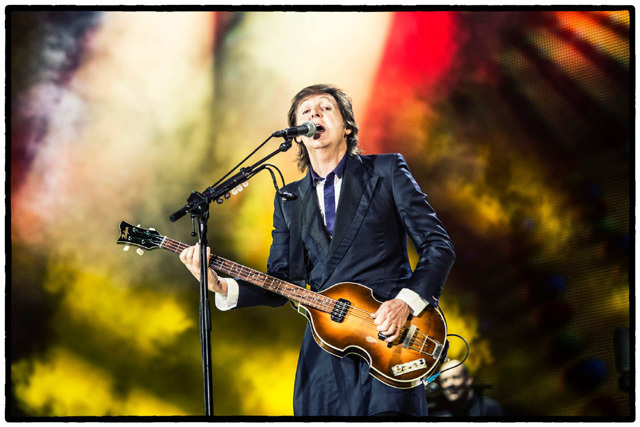 McCartney delighted the audience with the Beatles’ “Paperback Writer,” where he broke out the Epiphone Casino guitar he used on the original recording of the song in a straightforward performance of it. Later, McCartney and company literally busted out some fireworks for a rampaging rendition of the James Bond theme “Live or Let Die.” McCartney, on piano, and his band blasted through the song with fervor as the tempo and the fireworks built to a crescendo. To my surprise, you could feel the heat from columns of flame from many rows back! His storytelling skills and humble manners were on display particularly during several tributes to friends who have passed away. McCartney played a tribute to Jimi Hendrix and recounted how impressed he was when the late guitar player learned Sgt. Pepper’s Lonely Hearts Club Band in two days to play it at a show of his own. Later, McCartney played his song “Here Today,” a tribute to his late friend and bandmate John Lennon. While the song itself may not be particularly well known, McCartney’s sincere declaration of love to his old friend was moving. Only several songs later, McCartney picks up a ukulele to memorialize George Harrison with a tender undertaking of “Something,” which begins with McCartney solo before slowly blossoming into a show-stopping performance by the full band. Soon McCartney lightens the mood significantly with the Beatles “Ob-La-Di, Ob-La-Da,” enlisting the audience to sing along to the refrain, “life goes on.” McCartney returns to his stadium full of back up singers for to powerful effect during “Hey Jude.” I chose this moment to sprint through the field and up the stairs of the stadium’s first level to hear the perspective of “Hey Jude” sung all around me by thousands and thousands. It gave a new meaning to the term “surround sound.” I couldn’t help but smile. As I stood at the precipice of a stadium stairway and gazed over the crowd, I saw the audience collectively “took a sad song and made it better” with unmatched affection and gratitude for the Liverpudlian icon and his work. Sir Paul surely doesn’t give a hoot about 50-year-old rivalries — he’s way too nice and he’s having way too much fun. But from where I sit, this Beatle had a little more shine than the Rolling Stones on stage this year.